Scott Newsome was raised in Lake Louise, Alberta, in the Canadian Rocky Mountains, where he started snowboarding during the infancy of the sport. By age 16, Scott was snowboarding professionally and working on numerous film/photo projects that were some of the first to showcase the growing Canadian talent base. 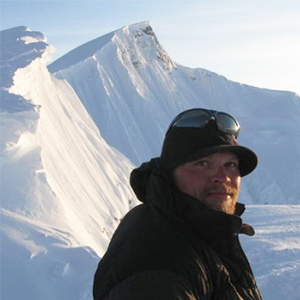 In 2005, Scott passed the Association of Canadian Mountain Guides Assistant Exam on his splitboard, making him the first ACMG certified snowboard guide to pass entirely on a splitboard. Now an ACMG certified Lead Snowboard Guide, Scott is an owner and head guide of Eagle Pass Heli-skiing in Revelstoke, BC. I am certified through the Association of Canadian Mountain Guides and am a Canadian Avalanche Association Professional. An old Austrian guide named Erwin Auberger. Erwin was one of my first mentors, he was on the back end of his 30+ year career while mine was just starting. He believed in snowboarders becoming guides when few others did; he was a closet boarder himself and used to guide on his board way back in the day with certain clients. Erwin was one of the few lucky guides that had the opportunity to be the first to open up heli ski terrain in the iconic British Columbia mountains, both the Selkirks and the Monashees. Erwin worked for 7 different CMH lodges and Mike Wiegele when they were just beginning to explore those mountains with a helicopter. What are you most excited about for the 18/19 season? After spending my first summer in South America, heli shredding the Chilean Andes, I really look forward to going back next summer. As a guide I need to have fast and efficient changeovers, from touring to riding and riding to touring. Spark R&D is the cleanest and the fastest. I put 150 days a year on snow working and recreating; I need durable gear that is bomber for all snow conditions while in both skiing and snowboarding modes.